If you are in entertainment industry, sooner or later, you will get your own line of Funko Pop figures. Same goes to the Titanfall that has its own figures on the way and we have to admit – they look pretty adorable. 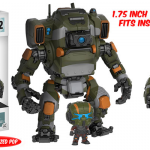 There are four Pop figures that each includes a Titan and a Pilot from Titanfall 2. What is interesting, that Titans seems to be larger than the traditional Pops, being 6 inches tall while the usual Pop figure is only 3.75 inches tall. The Pilots are minimized accordingly to the Titans size so they are just 1.75 inches tall. Just like in the Titanfall game, Titans have their chests ready to be opened so that their Pilot could be put inside of them. Every of the four Funko Pop sets includes different Titan and Pilot combo. These may be Jack from Titanfall with his Titan, BT. This particular set and two other Funko Pop sets of Titanfall 2 (Sarah/MOB-1316 and Blisk/Legion) is expected to appear in December. A special set of GameSpot that features the Atlas Titan and a generic Pilot will be released sooner, in October. Titanfall 2 will be released on October 28. The development of the game was reportedly completed and Titanfall 2 just went gold . There were also some information revealed, related to the new details about its campaign and story inspirations. Also, you can take a look at Titanfall 2 running in 4K at 60 FPS.